Just ordered both of these and wanted to give some very quick feedback before my larger post. Chromecast is Awesome for Queuing up Youtube playlists and Media playlists. Basically controlling the nice Audio system from your laptop / phone. Movies and TV Show’s are cool too, but limited in apps. Streaming video over a Chrome browser in HD is not ideal, but if you have the App extension, everything works fine. And remember, everything routes over your laptop / tablet / mobile device. Roku is Awesome for browsing videos: Amazon Prime, Amazon OnDemand, HBO Go, Netflix, Pandora (music), and Plex. BUT all using the remote control, so add one to the stack that you already have. The mobile / desktop remote is only that… a virtual version of the remote. It is a pain to type in movie / tv title’s, let alone your account credentials using up/down/left/right and Ok buttons. But, we all do that anyways with our TV remotes, so not much different. The Plus, you get the Internet easily! Two very different types of systems. Two different uses. 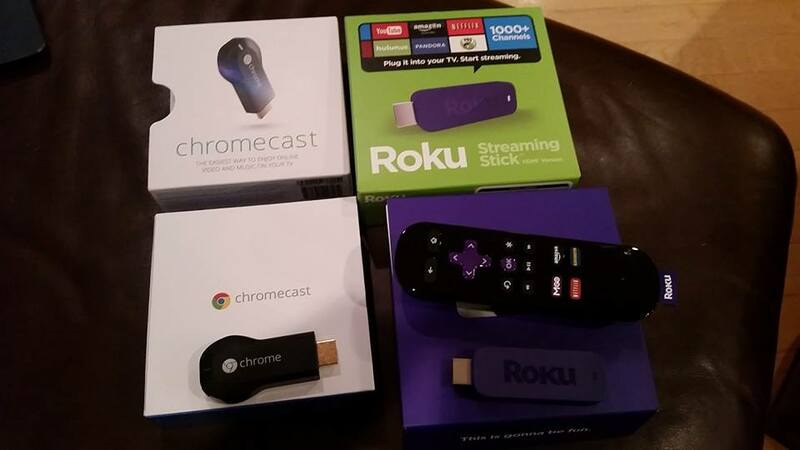 At the end of the day: Chromecast is an extension of your laptop and phone, where Roku is an extension of your media system to the Internet. I’ll keep them both on my main TV and see how much I use both of them. As of tonight, I am happy with both. This entry was posted in **, Amazon.com, Chrome, Electronics, Entertainment, Google, Home Projects, Internet, Media, Mobility. Bookmark the permalink.